No green thumb needed here. 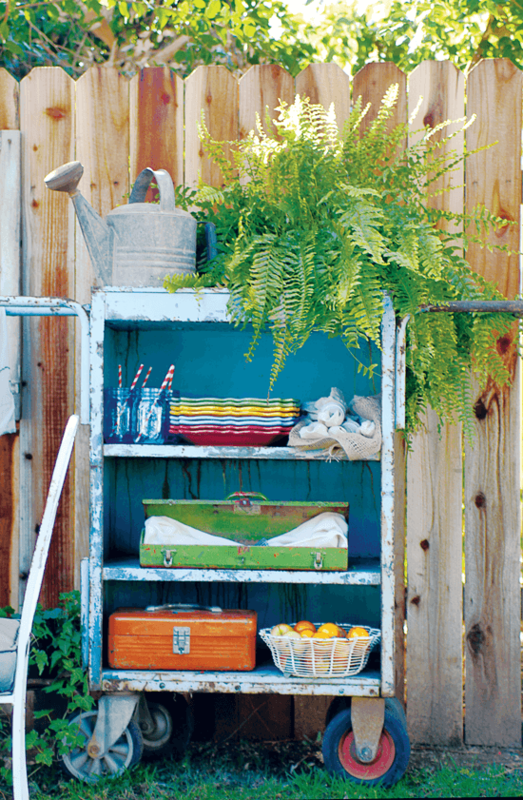 These creative ideas bring flea market fabulousness to your outdoor spaces. Ditch normal pots and planters this spring, and opt for something more creative with upcycled vintage finds. Look for unique pieces on your next flea-market adventure, or breathe new life into everyday items by taking them outdoors. 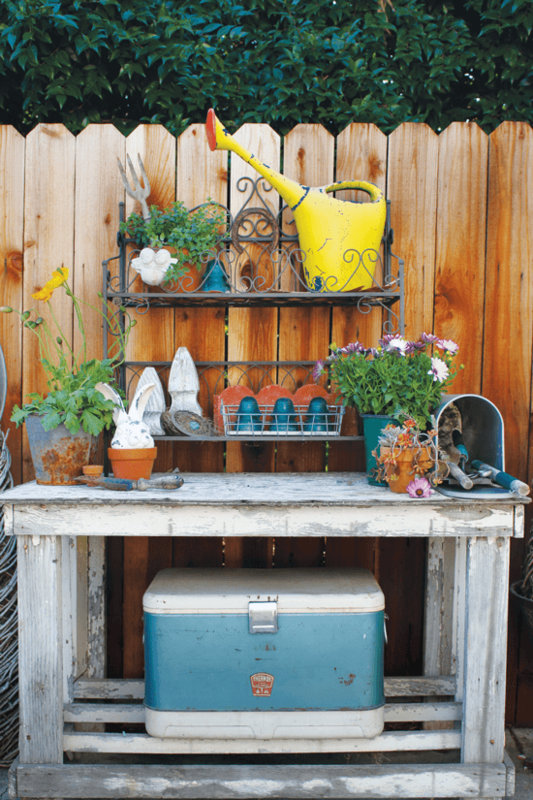 We’ve rounded up our 10 favorite ideas to upcycle vintage garden décor into practical yet pretty solutions for your garden. Every garden needs a comfortable spot to sit for those warm, leisurely afternoons when you can enjoy a good book under a tree. Wrought-iron garden benches have a whimsical look that pairs well with pastel floral linens, as seen here. 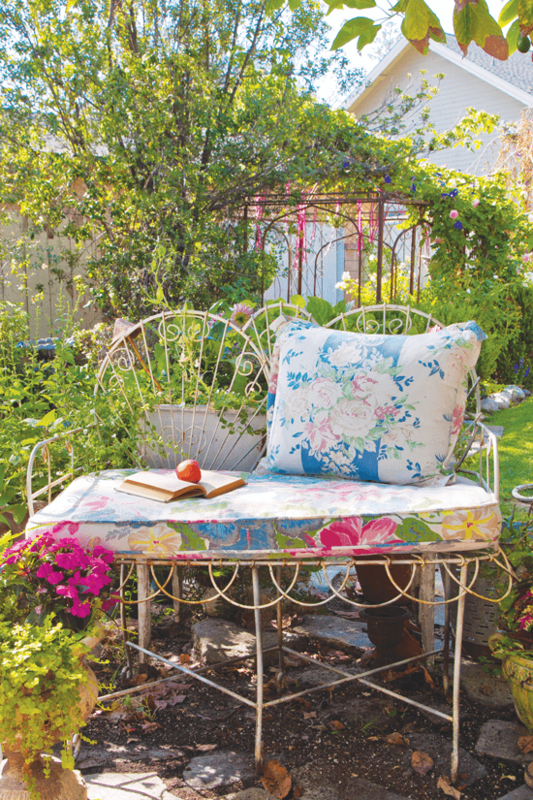 Cover some cushions in the vintage fabric of your choice, which you can use indoors or out. 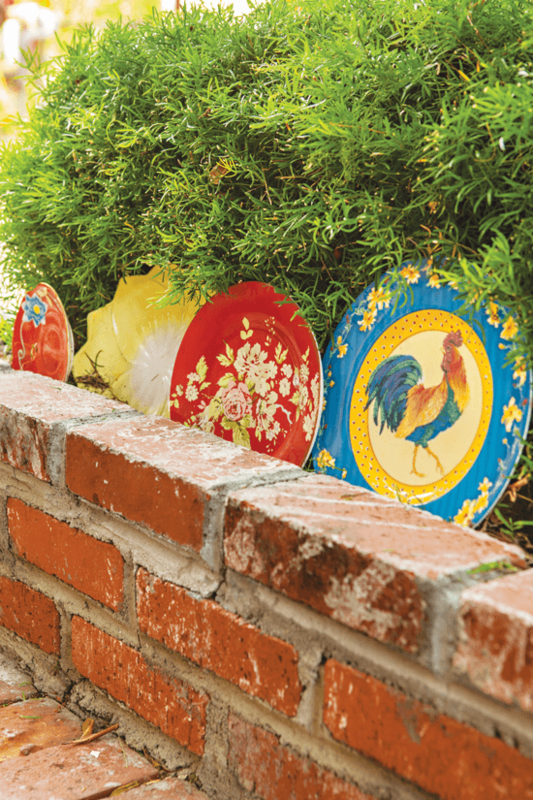 Do you have vintage dishes with chips or cracks that are too pretty to throw out? Use them to line the edge of a walkway by tucking them into the soil! These dishes have beautiful, vibrant patterns that pop. You could even use dishes with the same pattern for a more uniform look. 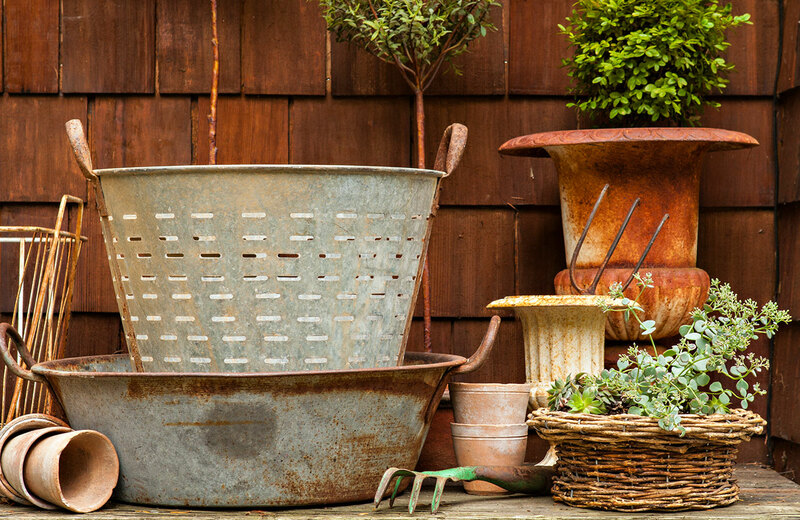 In flea-market gardens, when it comes to rust and patina, the more the merrier. Melaine Thompson of My Sweet Savannah uses her potting bench as a display space that gives her vintage garden décor a cottage chic touch. 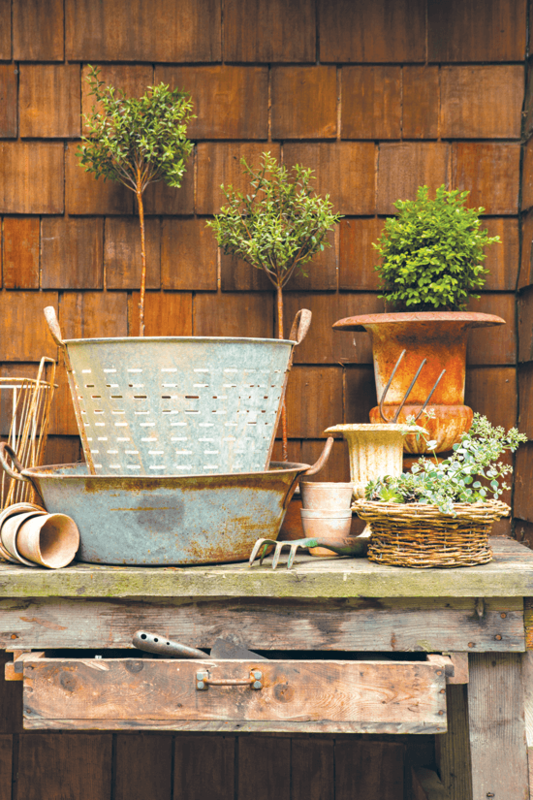 Whether you love a French country look or sway more towards farmhouse style, galvanized harvest buckets and cast-iron urns can be used as planters for topiaries or other large plants. 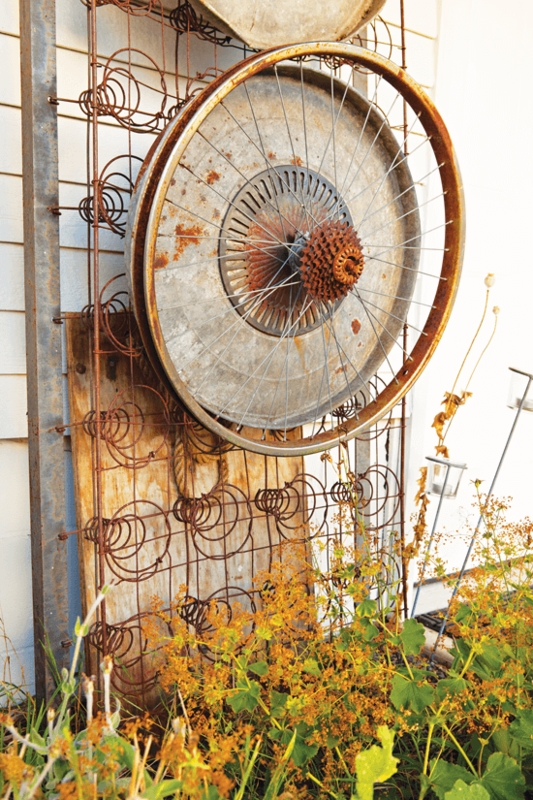 Artist Amy Duncan made this garden art piece was made from rusty, salvaged metal pieces like a mattress bedspring, grates and wheels. Try making your own vintage-inspired sculptures for the outdoors using rusted metals that contrast with the soft colors of your plants. 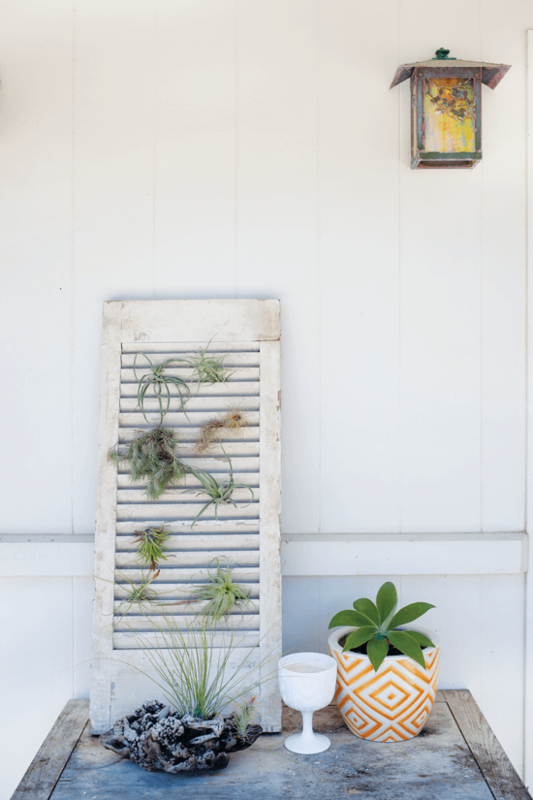 This white-painted wooden shutter is beautiful on its own but, when adorned with air plants in its slats, transforms into a sculptural work of art. Low-maintenance succulents and air plants are perfect for anyone who doesn’t have a green thumb. Air plants don’t need soil; they’ll thrive with airflow and misting alone. Industrial-style metal rolling carts are built to last—inside or outdoors. Use them in your garden to corral watering cans and plants. They even make great companions when you’re entertaining to store plates and silverware on. Grab a few metal toolboxes to hold smaller bits and bobs, and you’re ready to party. 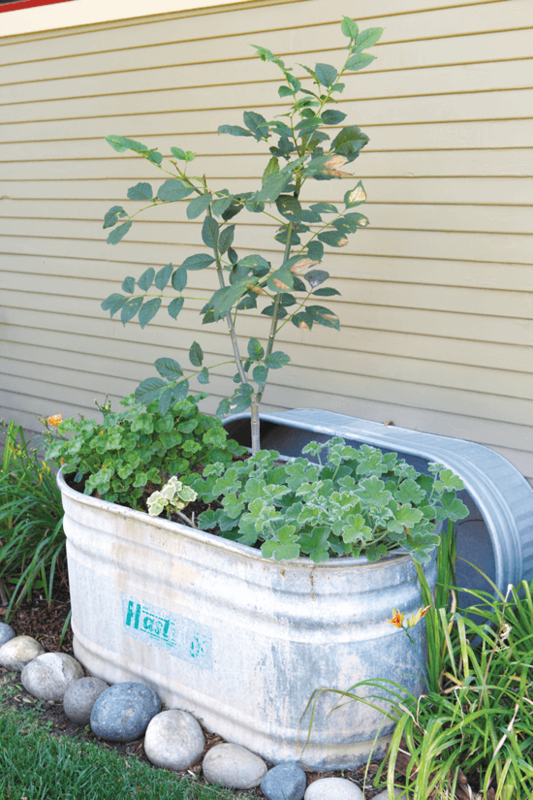 Make a statement in your garden by housing large plants in a galvanized metal washtub. You could even go bigger by using an actual vintage claw-foot bathtub as a planter with holes drilled on the bottom (for water to drain out). A washtub like this one will bring industrial style to your outdoor space for a quick weekend makeover. 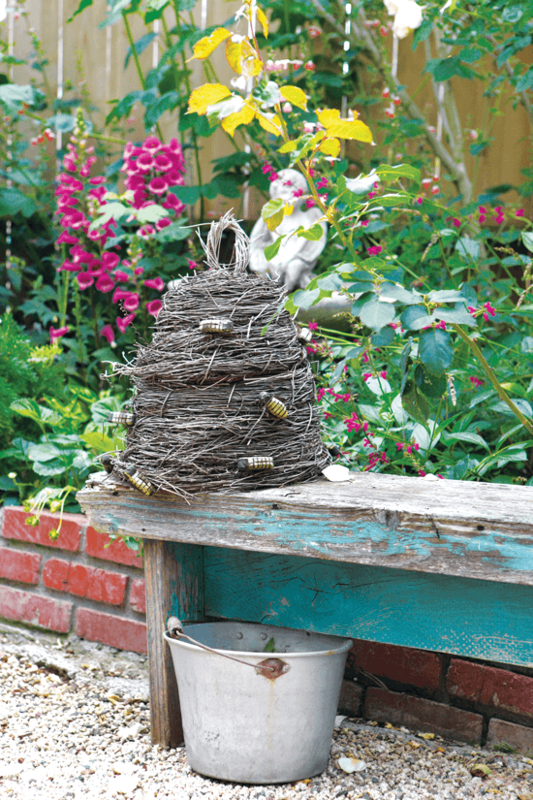 Antique primitive French bee skeps are a beautiful way to bring a hint of handmade style to your vintage garden décor. Their rustic, woven look and neutral color palette make them versatile pieces that go with a variety of styles. Add them to a garden table as an unexpected centerpiece or as an accent on a bench. 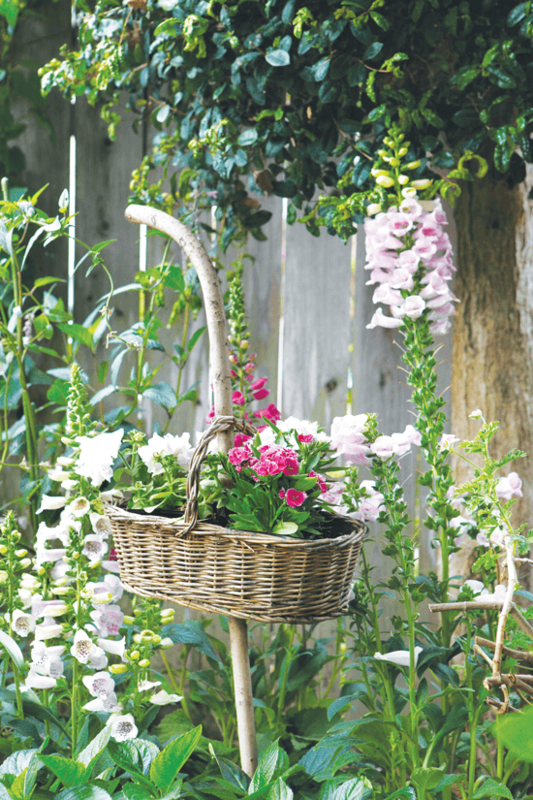 If you have a vintage flower basket that you use outside to gather your gorgeous blooms, consider using it for another purpose: as a planter. This one, hanging from the top of a wooden stick, puts these special buds on display. Vary the heights, shapes and sizes of your planters for a more compelling look. This potting bench stays neat and pristine thanks to a vintage mailbox filled with handheld garden shovels. Below it, a vintage Thermos cooler from the 1960s stores less attractive tools out of sight. Use other pieces like spice racks, floating shelves or pots to organize your tools to create a functional workspace. Want more garden ideas? 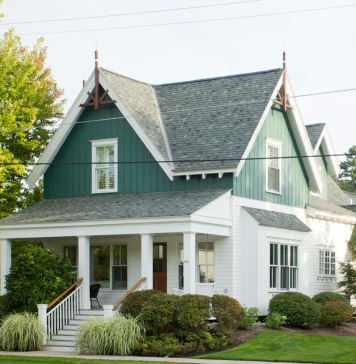 Check out this post on gardening by color. 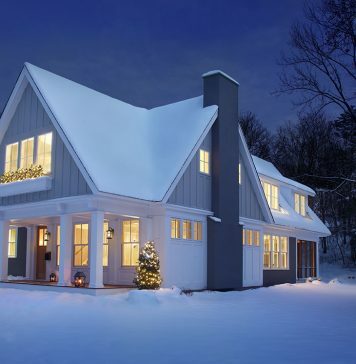 This ecofriendly cottage snuggles up to winter with a classic look and sustainable efficiency. 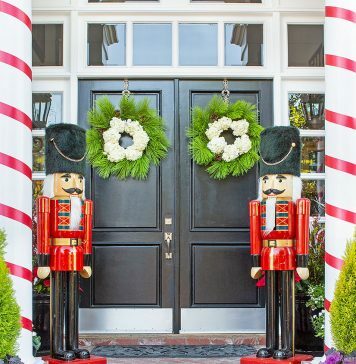 Get started with a simple wreath, or go all out for curb appeal that rivals the very finest gingerbread houses! 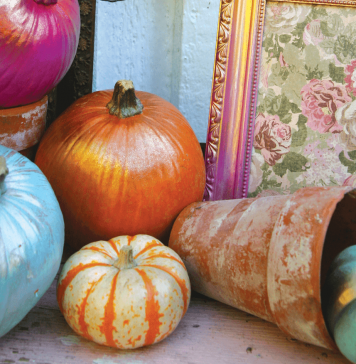 Attract visitors and brighten up your home with fun, unconventional fall décor. 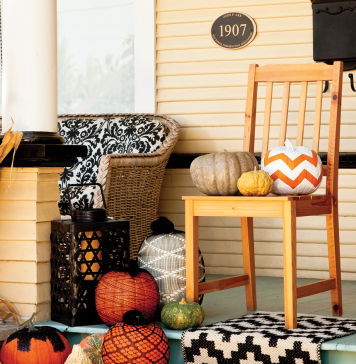 Halloween décor goes graphic and bold with this creative crafty twist on tradition. 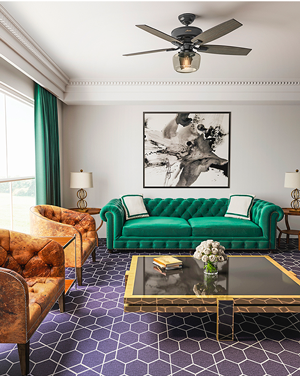 This new-build neighborhood revives the past with a celebration of classic architecture.